Concrete Coatings, Inc. Micro-Tek™ Micro-Toppings are commonly used on countertops or floors where an acid stain is desired, when the concrete itself is too abused to allow for a pristine surface. 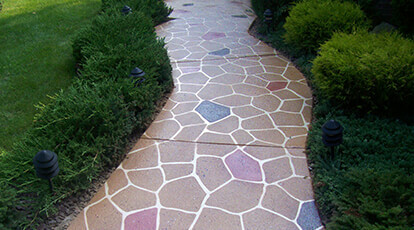 Rough Grade is available in natural, while Smooth Grade is available in white and gray. They are forgiving and easy to apply. 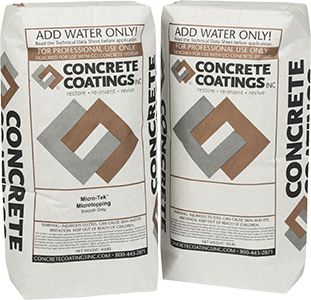 Concrete Coatings, Inc. Micro-Tek™ Micro-Toppings require rough grade (RG) as a base coat and smooth grade (SG) as a top coat. These Micro-Toppings have just the right addition of polymer in the mix for their application—just add water. A separate polymer is not required. MUST BE USED WITH MICRO-TEK™ MICRO-TOPPINGS ROUGH GRADE.